I just returned from visiting my Mom at her residential care facility. She was sitting with her private caregiver in the dining room having lunch, or actually, trying to order it. My mom has dementia and even a small task like selecting an item on the menu is a monumental undertaking. Her waitress stood patiently for several minutes suggesting different sandwich options not making it easier. I finally ordered her lunch, a turkey sandwich. She was fine with it. After living a very active full life with family, a career and worldwide travel, my 93 year old Mom lives in the memory unit at a residential care facility. She is in a wheelchair and needs a lot of TLC and hands-on care. Thank goodness she purchased a Long-Term Care policy back in 2001 to help defray the costs that now exceeds $8,000 a month. We had no idea how expensive it could be or that she would require so much help. She never wanted to move out of her home. Public awareness of long-term care insurance (LTC) is growing due, in part, to the realization that the government cannot or will not pay for long-term care costs. The increasing number of people joining the sandwiched generation (or working people responsible for the care of elderly family members) is another factor prompting employees to look to their employers for help. Many employers are responding by offering long-term care insurance. I purchased my own Long-Term care policy about the same time as my Mom through my employer. A group plan can provide significant advantages including discounts and streamlined health underwriting. There can be tax incentives and employer-sponsored long-term care benefit programs can be 100% voluntary (the employee pays the entire premium). Groups today can be as small as three (3) employees. 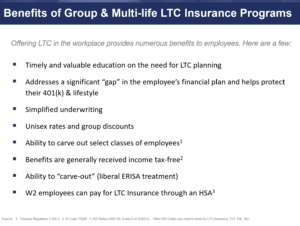 Coverage can include selected employee groups. It can also be offered to spouses, partners, parents and parents-in-law, as well as to retirees and even spouses of retirees. Executive Carve-Out Plans for key employees. Employer Paid Base Plans for management or all employees. Voluntary Plans for all employees. Voluntary plans are good news for employers that want to enhance their employee benefit offerings without increasing the bottom line. They can offer Long-Term Care insurance without paying any portion of the premium and some employers pay for their workers’ base policy and offer them the option to buy greater benefits. Many employees don’t fully understand the benefits of this kind of coverage. Sometimes younger people either believe the need is too far in the future to contemplate yet an increasing number of younger people under the age of 44 are purchasing policies according to the American Association of Long-Term Care Insurance. Surprisingly, many Millennials and Gen Xers find themselves unexpectedly caring for their aging parents. For some, the real wakeup call comes when their parents or grandparents need care. That’s what happened to me. My wakeup call happened on a trip to Chicago for a family visit over twenty years ago. When my cousin picked me up at the airport I was told we going to visit my Aunt Rose at the hospital. My poor Aunt was found by a neighbor in the parking garage after another fall. She had broken her hip. We soon discovered she had severe osteoporosis and could no longer live independently. My Aunt did not have Long-Term care insurance and spent her money down then passed away. When I returned home I spoke with my boss about what had happened. He asked me what we could do to help our employees. My answer was to offer Long-Term Care insurance. I was very fortunate that nearly twenty years ago my forward thinking employer agreed to make long-term care insurance available so that our employees would be assured coverage at a reasonable cost.